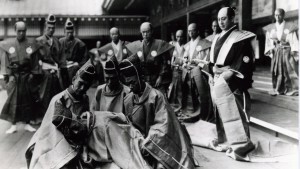 Having provided over 30 audio commentaries for DVD releases – one of them, for Mizoguchi’s The Loyal 47 Ronin, being four hours long – I feel I have earned the right to criticise the format. These voice-over commentaries provided by filmmakers, critics and historians are decidedly a mixed blessing. I sometimes wonder whether anybody, except the most dedicated and/or masochistic researcher, ever listens to them all the way through. No one can doubt that these voice-tracks sometimes give us splendid insight or information that we cannot obtain elsewhere in print. But are they really the best we can do in the quest to marry film criticism with the film-object itself? It is not usually recognised that audio commentaries on DVD arose due to a legal loophole. No permission is usually needed from the makers or rights-holders to a film to add such a ‘bonus’ soundtrack of somebody (or several somebodies) droning on for approximately 2 hours over the top. Officially, the film has not been ‘tampered with’ or re-edited in any way. You can choose to listen to the vocal extra or not. And this points to the first problem with audio commentaries: they are the easy, quick way to provide scholarly analysis, the ‘soft option’ – take it or leave it. Audio commentaries are simply an extension of written criticism. The voice of the critic speaks – sometimes literally reads – a verbal text. It usually coincides only loosely with the moment-by-moment flow of the film. The format is, in fact, at worst impossible, and at best a compromise: it is like a mad, desperate, jiving riff over a fleeting, ever-vanishing film-object. Try it in your lounge room sometime, you’ll find out how hard it is – and how easy to more or less ignore the film and offer a standard lecture on its context, background information, director biography, etc. The DVD craze has led to an intriguing mutation: the audiovisual analysis, or ‘digital video essay’, which re-edits clips to fit a concise voice-over analysis. This form flourishes on the Internet, thanks to admirable sites such as Kevin B. Lee’s Shooting Down Pictures and Catherine Grant’s Film Studies For Free . These are more adventurous than the mere vocal overlay. But still: the voice ‘leads’. It is the voice which has authority – more than the original images and sounds of the movie. There is something frustrating, even wrong about this. It is instructive to compare both DVD audio commentaries and video essays to what Jean-Luc Godard does in his massive Histoire(s) du cinéma. In fact, Godard has complained in an interview that he hates it when the voice – the law of the written/spoken text – dominates in a filmic ‘essay’: there is a lot of vocalising in Godard, but it is always displaced, decentred, at war with all the other elements of the work. It is not a voice which legislates or pontificates, which closes down meaning. It reminds me of what one unkind critic said when he exited the premiere of Chris Marker’s Sunless (1982): ‘Every image has its main point of interest in the centre of the screen, and the voice spells out everything for ninety minutes in a monotonal vacuum’ – like a TV travelogue. Of course, every film critic today secretly wants to be Chris Marker! Recently in Melbourne, the OtherFilm collective from Brisbane presented a ‘film collage’ devoted to jazz in cinema: prints were projected and played with on multiple screens, torches were waved around the theatre, sound was mixed live. It was an intoxicating mix of old-fashioned scholarly research, performance art, and ‘expanded cinema’. But there was deliberately something missing: a voice too much, explaining what it was meant to be all about. Critics need to make this kind of extra leap if they want to be, finally, artists or poets.